Cut the tops off the bell peppers, save for later use, and remove and discard the seeds and membranes. Arrange the peppers upright in a 5 ½ - 6 quart slow cooker. In a medium sized mixing bowl, combine the rice, beans, salsa, and scallions and season with salt and pepper to taste. Mix well. 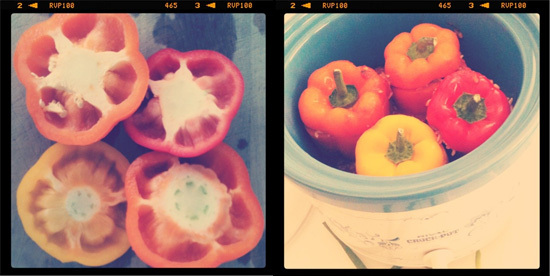 Fill the prepared peppers evenly with rice mixture, packing it lightly. Replace the pepper tops. In the same mixing bowl, combine the tomatoes, cumin, oregano and sugar and season with salt and pepper to taste. Pour over and around the peppers in the slow cooker. Cover and cook on Low for 4 hours, until peppers are fork-tender but still hold their shape.